Dezmin Reed of the Storm blocks Sawyer Petre's extra point attempt in overtime. PHOENIX, AZ - Sometimes, a special teams play can make a monumental difference. It can send one team to the championship and another on vacation. The Sioux Falls Storm were the beneficiary of such a thing tonight at Talking Stick Resort Arena. The Storm took the Arizona Rattlers to overtime in the Intense Conference champions. Storm quarterback Lorenzo Brown, Jr. found Damien Ford toward the back right side of the end zone for 20 yards to tie it in overtime. Miles Bergner's extra point lifted the Storm to the 69-68 overtime victory. Heading into overtime tied at 62-62, Verlon Reed, Jr. found Dezmon Epps for a 16-yard touchdown. On the extra point attempt, Sawyer Petre's kick was blocked by Dezmin Reed of the Storm. That left the door open for the storm, which they took advantage of with Brown's pas to Ford with Bergner's converted kick. Bergner hit all nine of his extra point attempts along with both of his field goal attempts on the night. The Storm are headed to the United Bowl for the ninth straight season. They will head to Des Moines to face the Iowa Barnstormers on July 7 at 5:05 pacific (7:05 central). The Storm won the season series over the Barnstormers this season, including a 52-40 win over the Barnstormers in week 4 at Des Moines. The Rattlers were last season's United Bowl champions, having defeated the Storm, 50-41. The Barnstormers advanced to the United Bowl on June 22 when they defeated the Nebraska Blizzard in the United Bowl Championship game, 48-17. The first half was much of a back-and-forth with both teams seeming to try to out-dual the other. The Rattlers scored on their opening drive on a three-yard run from Jamal Miles. A Lorenzo Brown eight-yard run tied the game at 7-7 before Verlon Reed found Dezmon Epps on a 41-yard bomb with 5:02 left in the first quarter to put Arizona back up by a touchdown. Sioux Falls evened the score at 14 apiece when Brown found Lyle McCombs for a 31-yard touchdown pass. Reed connected with Anthony Amos for a 21-yard touchdown, but Sawyer Petre's extra point attempt was no good, putting the Rattlers up by just six with 2:26 left in the quarter. Brown hit Damond Powell on a 34-yard touchdown bomb to give the Storm a 21-20 lead, which extended to the end of the quarter. Reed's eight-yard touchdown pass to Amos put the Rattlers back in the lead, but only temporarily. Powell returned the ensuing kickoff 48 yards to put the Storm back up. Miles scored his second rushing touchdown of the game, this one of five yards, and the Rattlers were back on top by six with 8:38 left in the second quarter. The Storm moved back up by a point on Brown's 14-yard touchdown strike to Powell. Reed hit Jamal Miles on an 11-yard touchdown pass with 2:32 left in the opening half and Arizona was back up by six. After pinning the Storm deep in their own territory, Nathan Lindsey stepped in front Brown's pass over the middle and returned it to the house for the 15-yard interception return for touchdown. Miles Bergner hit a 41-yard field goal as time expired to cut the Rattlers' lead to 48-38 at intermission. Reed was a perfect nine of nine passing in the first half. He started in the season opener for the Rattlers against the Storm, but was injured early in that game. He was replaced by Jeff Ziemba, who remained the starter for the duration of the season. Ziemba was injured in the regular season finale, though still available for this game. The Storm had the ball first in the second half, and drive down to the one-yard line, and Brown ran it in from there. The Storm then got their first stop forcing the Rattlers into a long field goal attempt, which was wide to the left. Sioux falls took its largest lead of the game on a 25-yard run by Brown with 3:08 remaining in the third quarter. The Rattlers went back on top, 55-52 on Epps 16-yard run with 13 seconds left in the quarter. McCombs rushed in from two yards out and the Storm were back in the lead at 59-55 with 9:55 left in regulation. Reed's two-yard run put Arizona up by three before Bergner knotted the score at 62-62 with a 30-yard field goal with 3:30 remaining. The Rattlers had the ball last and had a chance for the win, but Sawyer Petre's field goal with four seconds left was no good, sending the game into overtime. It was the second time this season that the Rattlers lost a home overtime game by identical scores of 69-68. They fell to the Barnstormers by that same tally on May 20. Sioux Falls won it's second straight overtime contest after having defeated the Green Bay Blizzard in the regular season finale, 69-61. Combining the regular season with the playoffs, there have been three overtime games this season. The winning team has scored 69 points in each of those games. The game was even statistically, with the Rattlers having an edge of 278 yards to 263. The Storm held the advantage in passing, 167 yards to 148, while the Rattlers outgained the Storm on the ground, 130 yards to 96. Sioux Falls were penalized eight times for 44 yards, while the Rattlers were flagged five times for 51 yards. The only turnover in the game came on Brown's interception, which was returned for a touchdown by Lindsey. Brown completed 13 of 22 passes for 167 yards with four touchdowns and an interception. He also rushed 11 times for 72 yards and three scores. Powell caught 4 passes for 55 yards with two touchdowns, and scored on a kickoff return for touchdown. McCombs added five catches for 68 yards to his rushing touchdown. Amongst catching the touchdown pass in overtime, Ford had 40 yards on three receptions. 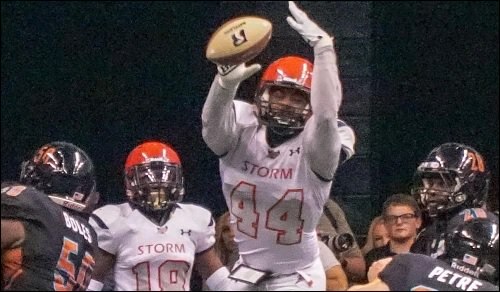 Damond Smith II was all over the field, tallying 12.5 total tackles for the Storm defense. Reed made the most of his first start in over four months. He went an impressive 15 of 18 for 158 yards with five touchdowns. He rushed nine times for 33 yards and another score. Epps rushed five times for 43 yards with a touchdowns, and caught six passes for 80 yards and a score. Miles rushed 6 times for 22 yards and a pair of touchdowns, while catching two passes for 13 yards and a score. Amos, a holdover from the Ratters' Arena Football League days, caught four passes for 46 yards and two touchdowns. Davontae Merriweather led the Rattlers defense with 7.5 total tackles. The United Bowl will be streamed live on the IFL's Official YouTube Channel. SCtoC will present its preview within the next week. That preview will be located on the IFL Board of this forum. I just watched this on YouTube. What a game! I kind of thought that after the blocked extra point in OT that the Storm would win. It really was a terrific game. It's right up there with the game of the year. Props to Gary for getting that photo of the PAT block!